Adapted primary literature (APL) is a novel text genre that retains the authentic characteristics of primary literature. Learning through APL represents an educational intervention with an authentic scientific context. 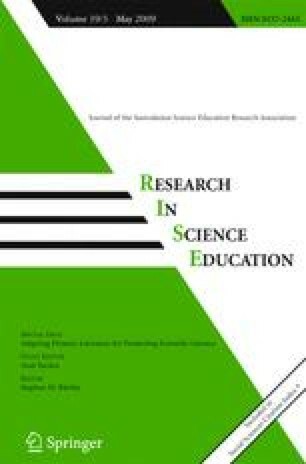 In this case study, we analyzed the 80-min discourse developed during the enactment of an article from an APL-based curriculum in biotechnology in one class, and examined epistemic practices used by students during their meaning-making of the Results and Discussion sections of the article. Specifically, we examined coordination practices, by which students connected elements belonging to different epistemic status or context (theory, data, experimental stages, biotechnological applications and text). The application of coordination practices was identified more than 70 times during the lesson. In the context of the Results section, the students displayed research-oriented coordination practices, which were frequently associated with claims of comprehension difficulty. In the context of the Discussion section, students displayed text-oriented coordination practices, associated with analysis of the text characteristics. We are suggesting that the research-oriented coordination practices and some of the text-oriented ones enabled the emergence of authentic scientific practices and learning by inquiry. Another type of text-oriented coordination practice enabled reflection on scientists’ experimental processes, enabling learning science as inquiry. The enactment model of APL used here allowed for both the emergence of the two dimensions of inquiry learning and the promotion of scientific literacy in the fundamental and derived senses. We thank the teacher, Micheline Gutman, and students who participated in this study and Maria Pilar Jimenez-Aleixandre for her useful comments on an earlier version of this manuscript. AY is the incumbent of the Helena Rubinstein Career Development Chair.